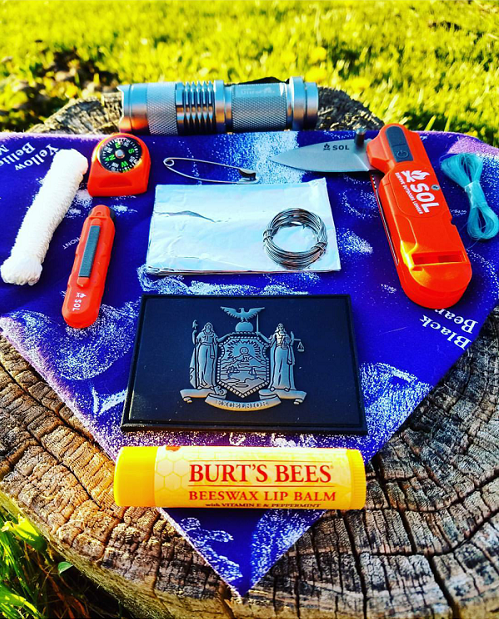 This week’s prepper gear spotlight comes from @k.m_ink on Instagram. His spotlight consists of a small survival kit. This isn’t meant to be a full out survival kit but are some useful tools to help you in a disaster. The SOL (Survive Outdoors Longer) Kit consists of a signal mirror, whistle, folding knife, button compass, flashlight and a fire starter. It’s a great way to keep your survival preps organized in one place so that you can quickly grab it without digging around in a bag to find them. Of course you could go bigger and better but this would still be a great substitute if it is all you had. Along with this spotlight he has included some Burt’s Bees Beeswax Lip Balm which is a great tasting balm. You can feel manly when putting on this lip balm. Finally is you have a handkerchief along with an Olight S10-L2 Flashlight. If you would like to share some of your prepper gear on the next spotlight then shoot me some pictures. You can either send it to aaron@smartpreppergear.com or DM me on Instagram @Smartprepper. Label each item accompanied with your gear along with any theme that you may be following.